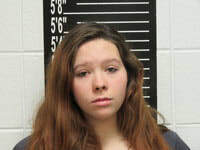 Dakota C. Moore, 18, is charged with murdering her 9 month old in Crane last September. New charges have been filed in the death of an infant that took place in Crane last September. On Wednesday, May 9, Dakota C. Moore, 18, was charged with first degree murder of her 9 month old child. She is also charged with child abuse resulting in serious injury, first degree domestic assault and child abuse resulting in death. When Moore was first arrested, on Friday, September 15, she was charged with first degree involuntary manslaughter and abuse of a child resulting in death, according to previous coverage of this story and a press release from the Stone County Sheriff’s Office. Special Prosecutor Amy Fite, Prosecuting Attorney for Christian County, was unable to provide any comments on the cse per Missouri ethics rules. “Unfortunately, I’m just not able to say anything about the case at this time.” This included questions about dismissing the old charges, the new charges and what penalty Fite will seek at trial. Moore is being held in the Stone County Jail in lieu of $150,000 cash or surety bond. Online court records also show a special instruction on her warrant to have no contact with anyone under the age of 18 through any medium. A new probable cause statement and felony complaint were submitted to the court on Wednesday, May 9, when the new charges were filed against Moore. Specifically, the probable cause statement was updated to include further autopsy findings. The initial autopsy was completed by an individual identified as Dr. Glenn in the probable cause statement. Dr. Glenn reportedly found that the child had numerous injuries, including broken ribs, “multiple rib fractures that are consistent with non-accidental injuries,” the statement says. However, Dr. Glenn did not make a finding as to cause of death. Stone County Coroner John Cunnyngham requested Dr. Mary E. Case, chief Medical Examiner for St. Louis, St. Charles, Jefferson and Franklin counties review the autopsy and other related documents. The probable cause statement, dated May 9, 2018, states that Dr. Case reviewed the autopsy report, samples, photographs and the Sheriff’s Office report. Dr. Case reportedly found evidence that the child died by suffocation at the hands of another. “It is a homicide,” according to correspondence between Case and Cunnyngham quoted in the report. The cause of death was found to be asphyxiation by suffocation. The case has been assigned to Judge Mark Alan Blankenship. No court dates have been set as of press time Tuesday afternoon.